There is less can be said about the quality of the photos in the book Onzichtbaar Gent / Invisible Ghent by photographer and writer Hans Aarsman than about the context in which they are set. Aarsman is a photographer who works from the conviction that photography today is hardly in a position to produce meaningful images, if at all. With him there is no fuss about rigidly styled compositions or jargon about photographic technicalities and difficult lenses. His photos are always pretty close to snapshots. The focus is not so much on what the photo shows, but more that it is actually noticed. The photo is the corpse that you have to turn your back on in order to grasp something of the cause of death or the motives of the murderer. The photos only make sense when placed in context. Watch Aarsman click away. See how it is seen by him and how the image is assumed into Aarsman’s personal view of the world, which he propagates in books, columns and theatre monologues as well as in his ­photos. And observe how in that fragmentation it is about just one thing: the discrepancy between human intentions and their actual effect, the world as a dumping ground for dashed good intentions. In the case of Onzichtbaar Gent / Invisible Ghent you therefore have to look further. Notice also how the commissioner, Gent Cultuurstad (‘Ghent, City of Culture’), peers over the shoulder of the photographer with its own good intentions. 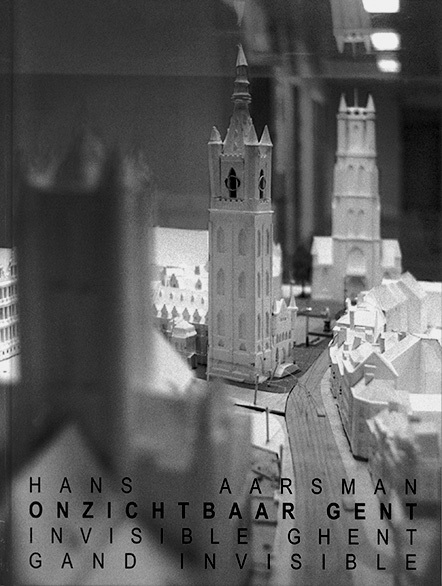 It is remarkable that Aarsman should have been commissioned to capture the urban identity of Ghent. Aarsman, as a Dutchman foreign to this city, fits in the tradition of creating identities, in which the outsider is needed in order to recognize specific qualities. The fact that Ghent is preoccupied with its own identity is also part of a widespread renewed interest in ‘the local’ as a counterweight to ever-sprawling globalization. In Belgium, all the major cities have received funds specifically intended for this purpose from central government. It therefore speaks volumes about the kind of identity mentality of the commissioners when they choose a photographer who works from the paradox of the ‘unchosen’ image, who gives a wide berth to the pitfalls of representation, someone who in the introduction to his book does not even consider himself capable of finding any­thing typical of Ghent amidst ‘… leaflets that come through the ­letterbox, the curlers, the ugly buildings, the beautiful buildings, the ashtrays …’, in short ‘… the endless procession that passes by us every day.’ Besides his photos, Aarsman does present us with graphics about, among other things, dishes on restaurant menus and the number of patches of ­chewing gum per square metre on the pavements in front of eight buildings in Ghent, but that doesn’t provide any sublime characterization either. Everything about Onzichtbaar Gent / Invisible Ghent exudes a lack of faith in making generalities specific and in the pronouncement of definitive statements. In this way, Onzicht­baar Gent / Invisible Ghent betrays – deliberately or acci­dentally – the commissioner’s ambivalence towards its own ‘good’ intentions. The organization therefore seems to recognize the Sisyphean quality of the whole problem surrounding the shaping of identity: the quest for identity only arises when there is awareness of a shortcoming. Someone who knows who he is simply doesn’t ask the question. Yet the instant the issue is raised, as a modern human being or as a city in search of a self-image one can do nothing but repeat the question ad infinitum. Every answer is as worthy as it is temporary, until the day that you simply forget the question. Only then can you be reconciled with what you are and, bien étonné, feel yourself connected with Deleuze – a thinker who categorically refused to view the world based on a notion of iden­tity – and ascertain in unison with him that it is not about the answer, but about sidestepping the issue. Arnoud Holleman is a visual artist and writer, living in Amsterdam. In general, his work is based on the role of language in the experience of the visual.